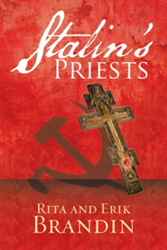 In Rita and Erik Brandin’s historical thriller, “Stalin’s Priests” (published by iUniverse), a KGB secret police agent turned undercover priest must sacrifice everything to execute Joseph Stalin’s order to destroy the holy church. The book is available for purchase at: https://www.amazon.com/StalinS-Priests-Erik-Brandin-ebook/dp/B07CJDN4M4. Joseph Stalin is the mastermind of a secret plan to infiltrate the Catholic Church with his spies posing as priests, to manipulate and eventually destroy the church from within. Stalin enlists the help of his best agent, Rolf Wozzak, to complete his plan to dismantle the church to achieve his vision of a utopian communist state. While undercover, Rolf unexpectedly falls in love with a woman named Shannon, which threatens to change the course of Stalin’s plans. Rita and Erik Brandin live in San Diego, California. They share a love for their Catholic faith. Erik Brandin grew up in the Catholic Church and was an altar boy. Rita Brandin converted to the faith when they were married more than 20 years ago. They have made pilgrimages to Fatima, Medjugorje, and Santiago de Compostela. “Stalin’s Priests” is their first novel, and they are currently working on the sequel to it.